UA-59651954-28 Crafty Allie: Flea Market, Craft Fair, Auction, or Family Reunion? 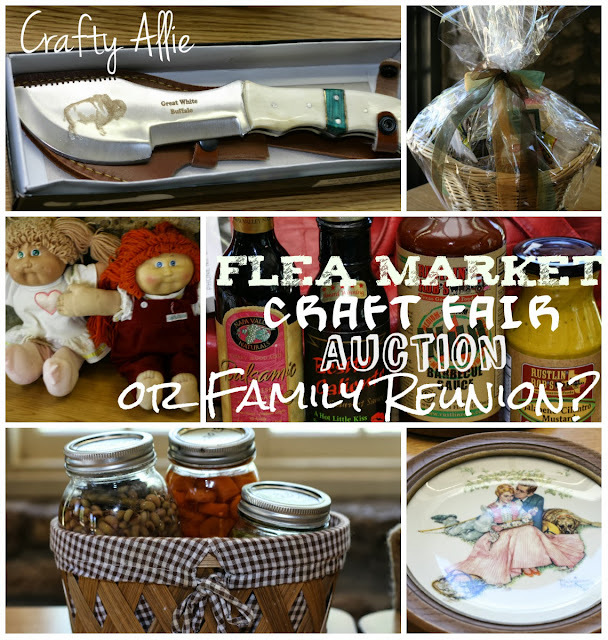 Flea Market, Craft Fair, Auction, or Family Reunion? I know I broke the proper title grammar rules just now. I even misspelled grammar (Thank God for spell check). But what good is blog writing, if you can't brake the rules, and just have fun blogging right? Am I right? Anyway, this weekend I went to my family reunion. We have one every year. 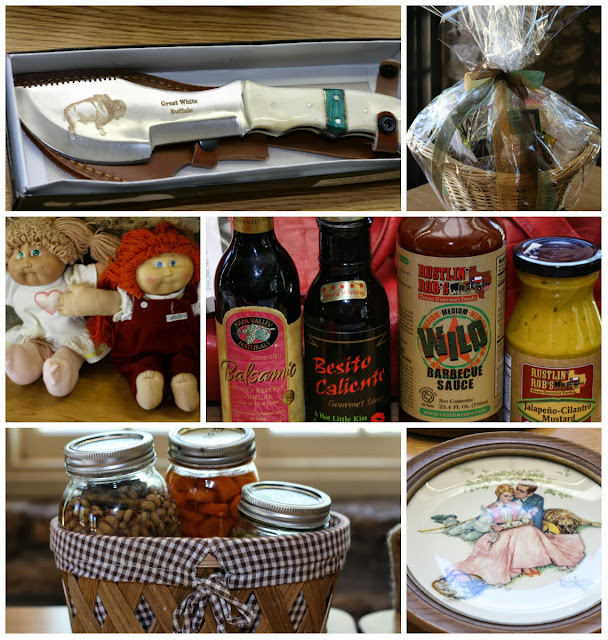 In order to provide lunch and the reunion hall all weekend, we have an auction. Everyone is supposed to bring an item. It can be something for the kids, or a collectible. It can be an interesting item, or handmade. I mean as long as you don't bring your dirty knickers your're pretty much allowed to add it to the auction. Everyone bids, and hopefully bids high, so that there will be enough to raise money for the next year. Although there weren't a lot of attendees this year, we still had some interesting enough items for the auction, and made a little over $2000. My mom crocheted a blanket. I on the other hand, have been too busy making stuff for the blog, Etsy and eBay, that I didn't get the chance to add anything handmade. 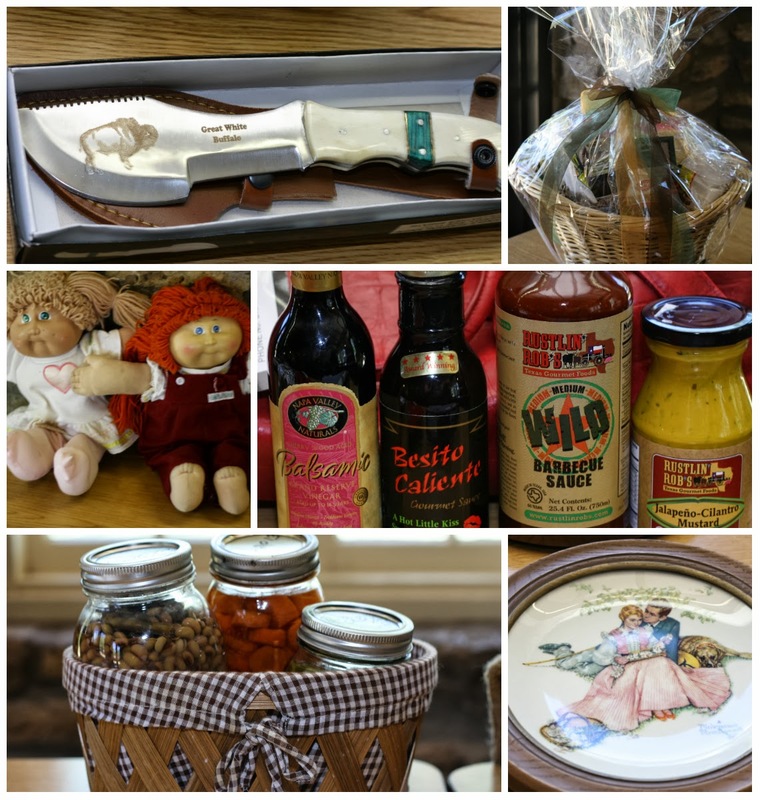 So, I took a looksie around my house and put some stuff in there for the kiddos to bid on. Hey my stuff went for $60, not too bad for a last minute grab fest. These are a few of my favorite relatives from the reunion! My new favorite addition loving on my Uncle's Doggie on the top left. My mom's cousin Nancy, my 3rd cousin on the top right. And my daughter bottom right, whom was bored at the auction because their weren't that many kids toys (except the ones we brought). 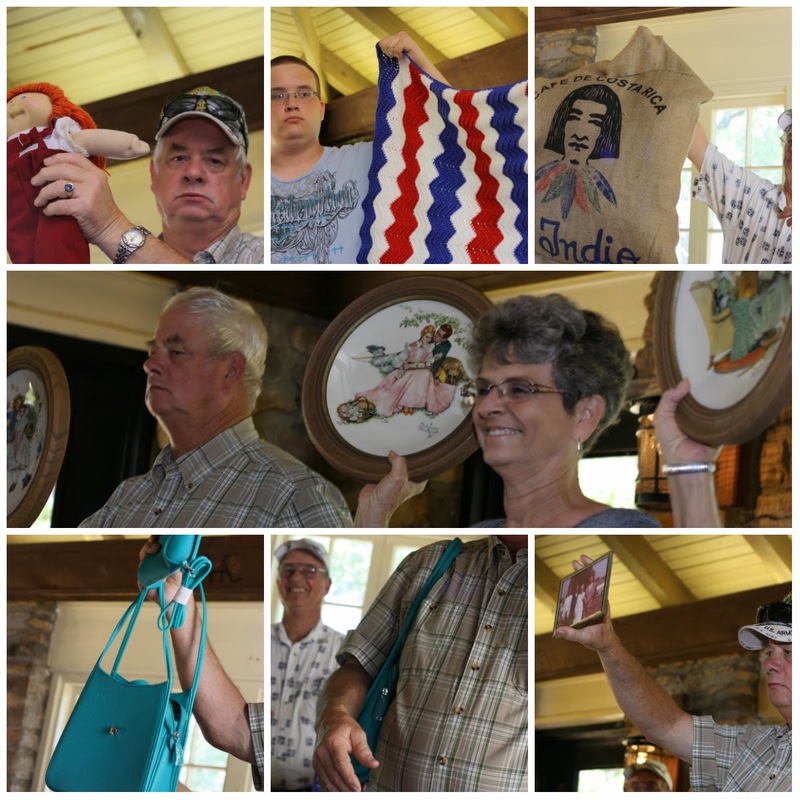 Here are a few pictures from the auction. I just love the one of my cousin modeling the purse. We all had to grab a picture of that for blackmail later on. Look at those plates! Those are Norman Rockwell plates worth $160 for the set of 4. Someone paid $100. Old pictures of our passed relatives go for a lotta, lotta money! And don't you just love my cousins expression while holding that cabbage patch doll. He again, wasn't too happy about me snapping pictures of holding girly items. Later on I hosted our annual Karaoke Jam. However there were barely any family members left and the ones that were still there weren't excited about singing. 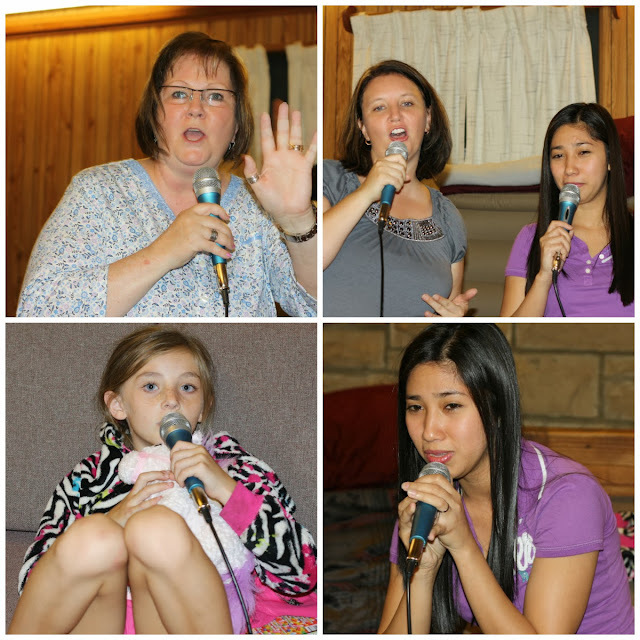 So, I packed it up early and my mom , daughter, sister in law and I sang back at the cabin. I think my Mom may kill me for posting this picture. Hey at least I didn't post in to Facebook right? Hopefully, no one from Facebook sees this and tries to post it there, lol. We had a great time. This year, it was my sister-in-law's first year to go with us. Hopefully we didn't scare her off too bad, lol. Very creative way to fund a reunion! Much better than just charging. Love it! BTW, I found you via House on the Way's link party! Thanks Alison! Thanks for stopping by! Now following you! 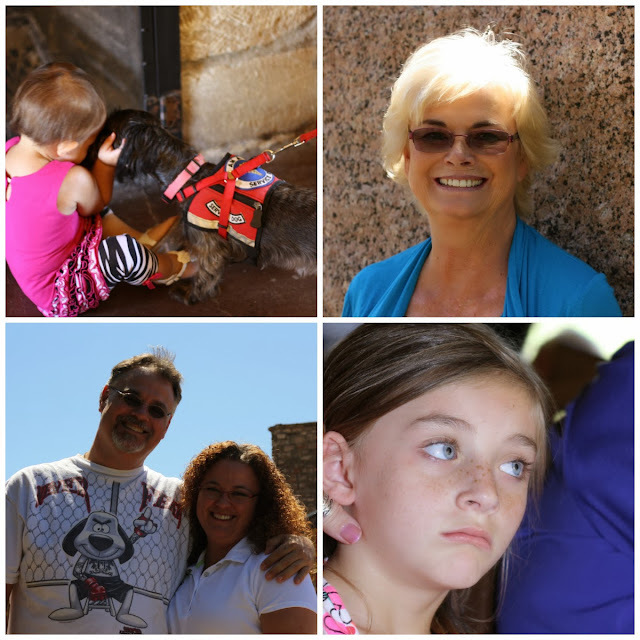 This post has helped me figure it out that Family time is totally priceless. The auction & the crafty moves you guys have done are very cute. I love all the photos, especially the one with vintage photo frame. Yay, thanks Jessica! I just followed your blog now, and love your ideas for making your own framed chalkboards! It's always nice to reunite with my family, no matter how crazy they are, lol. Good Afternoon Allie, What a fabulous way to raise money for a get together. I loved your cousins face, he really was not comfortable holding a "girlie" item was he, but I bet he enjoyed the rest of the day. Your cousins little dog was so sweet. I love the blanket which your mum crocheted, it's really lovely. Allie, I have enjoyed my visit and it was fun meeting your family. I have become a new follower, oh yes, just to let you know, I found you at Cathy's A Peek Into My Paradise. I would like to invite you to visit me at Ivy, Phyllis and Me! where you will be made most welcome. SO Sweet, you made my day! Following you back! What a great way to fund a reunion. I know it's fun to see what everyone brings to the auction. Thanks for your visit an comment at my place. What a great idea. oh the Cabbage Patch brings back memories! I even bought my kids one when they were little and they couldn't of care less about it. Thanks for popping by. I'm off to look around your blog. What a great idea for a family reunion! We always take up donations, but this would be so fun! Thanks for sharing at Share Your Stuff Tuesdays! Have you heard about the Fall Blog Sale?